Surrey Downs is an affordable active adult community located on the northern end of Howell, on the Freehold Township border in Monmouth County, New Jersey. It is perfect for active retirees looking to downsize while remaining close to friends and family. The community is comprised of 443 homes available on a resale basis. A clubhouse and community manager are part of the amenities offered at Surrey Downs. In addition, Surrey Downs offers bus service to shopping venues and the Howell Senior Center, as well as transportation service to local medical centers and hospitals in Monmouth County. A Saturday shuttle to other 55+ communities is available as well. Residents also have easy access to off-site transportation routes and the Jersey Shore. The clubhouse offers residents many opportunities to stay healthy and fit as well as a place to relax and socialize. Residents can work out by themselves or in groups at the well-equipped fitness center, complete with indoor Jacuzzi for replenishment after an invigorating workout. The spacious great room holds 300 and includes a kitchen. It serves nicely as a ballroom, as well as a gathering place for smaller social functions of all types. The clubhouse also hosts a card room, billiards tables, and a library. Outdoors, residents can stay active on the tennis courts or by playing bocce ball or shuffleboard. There is also a large outdoor pool perfect for cooling off during hot summer days. Construction began in 1986 and was completed in 1997 with 443 residences. There are a total of 13 different models ranging in sizes from 760 to 1,383 square feet. All have two bedrooms and either one or two bathrooms. Most models have garages and some have lofts. The larger models even have two master bedrooms. Some other desirable features of the residences in Surrey Downs include formal dining rooms, Florida rooms, upgraded kitchens and appliance packages, thermal windows, patios, enclosed porches, decks, and storm doors. The monthly association fees include common area maintenance, community bus, pool, clubhouse, lawn care, landscaping for the front of the house, snow removal, garbage, and recycling. Residents are responsible for maintaining the exteriors of their homes, which keeps the maintenance fees low. This is a perfect community for active retirees looking to downsize without sacrificing comfort. Residents have plenty of opportunities for fitness and fun activities. A community manager handles planning of social events and trips. Some popular activities and social events include cards, bingo, Scrabble, ceramics, tennis, travel club and much more. Although this is an established community, new residents are always welcomed with open arms and encouraged to participate in the various existing social clubs and interest groups. Surrey Downs at Freehold is located approximately one mile east of Route 9. Residents can easily walk to Dunkin Donuts, Walgreens Pharmacy, and a food market. Also nearby are the Freehold Mall, Centre State Hospital, and Battleground State Park. Beach and sun lovers will also enjoy living in close proximity to the Jersey Shore. Atlantic City, Philadelphia, and New York City are all easily accessible and make great destinations for day trips. All three cities also have international airports if residents want to travel a long distance. On-site, residents can utilize the community transportation service to run errands, go shopping, or for medical care. Surrey Downs is the perfect active adult community in Central New Jersey for today's 55+ homebuyers. There are plenty of activities available in Surrey Downs. Here is a sample of some of the clubs, activities and classes offered here. There are a variety of models offered within the community on a resale basis that range in sizes from 760 to 1,383 square feet. All homes have one to two bedrooms and either one or two bathrooms. Most models have garages and some have lofts. The larger models even have two master bedrooms. Some other desirable features of the residences in Surrey Downs include formal dining rooms, Florida rooms, upgraded kitchens and appliance packages, thermal windows, patios, enclosed porches, decks, and storm doors. The monthly association fees include common area maintenance, community bus, pool, clubhouse, lawn care, landscaping for the front of the house, snow removal, garbage, and recycling. Residents are responsible for maintaining the exteriors of their homes, which keeps the maintenance fees lower than those of other condominium type communities. Please Note: Not all floor plans are available at this time. Our first impression (on tour of S.D. with a real estate agent)was love at first sight but being realistic, perhaps actually living there is not as ideal as its presented to be?? Would love to hear other opinions or is that possible? 55places.com is not affiliated with the developer(s) or homeowners association of Surrey Downs. The information you submit is distributed to a 55places.com Partner Agent, who is a licensed real estate agent. 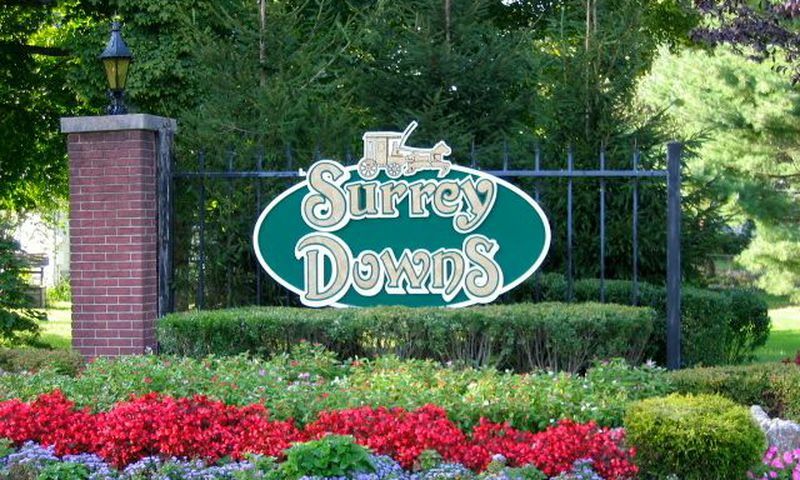 The information regarding Surrey Downs has not been verified or approved by the developer or homeowners association. Please verify all information prior to purchasing. 55places.com is not responsible for any errors regarding the information displayed on this website.